Knee surgery, knee surgeon, London knee surgeon, London trauma surgeon, leading academic knee surgeon, knee replacement, ACL reconstruction, ligament reconstruction, private knee surgeon, Chelsea knee surgeon, knee arthroscopy, keyhole surgeon, robotic surgery, best knee surgeon London, best knee surgeon. An image captured during keyhole surgery of worn out cartilage in the inner half of a knee. Knee replacement surgery is a well-established way to treat advanced arthritis. Pioneered over 50 years ago, this has now improved to the point where most patients only require a single procedure that then lasts them a lifetime. The decision to offer you joint replacement surgery will only be made after a very careful discussion of your symptoms, a thorough physical examination and with the results of x-rays. We will also discuss other treatment options, please see the "Knee Arthritis" section for further details of these. Successful knee replacement will transform your life, relieving pain and restoring function. However, a replaced joint does not necessarily feel the same as your healthy joint did. 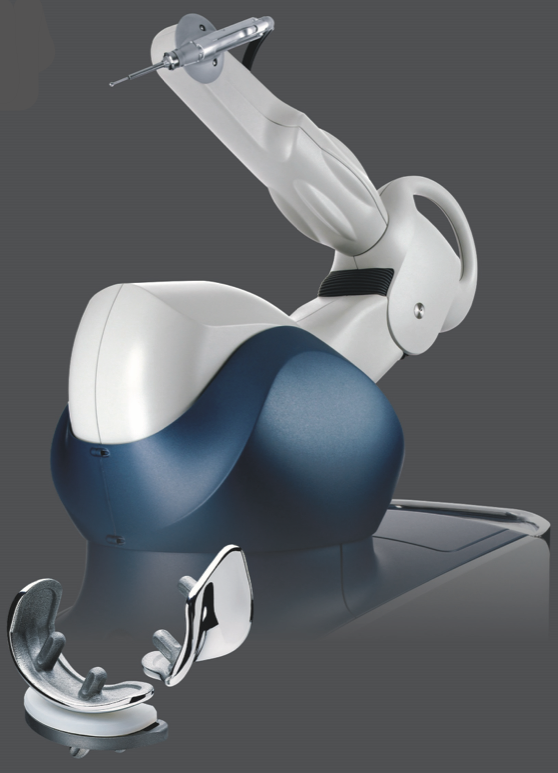 The operating robot employed for partial joint replacement. The type of procedure will be tailored to the pattern of wear in your knee. When this is isolated to a single part then partial joint replacement may be a good option. This can be carried out with the latest robot-assisted technique to ensure the utmost accuracy. Often a total knee replacement is necessary to resurface all of the damaged areas within the joint. Currently this is carried out with computer navigation, to ensure the implant and its position within your knee matches your own anatomy as closely as possible. Recovering from joint replacement surgery is a real team effort. You will receive a referral to physiotherapy to improve the rate of your recovery and help the leg regain strength. In the initial stages you will benefit from regular icing of the knee to reduce swelling. Most patients find that they are able to return to normal activity by 6-8 weeks with total joint replacement, and 4-6 weeks with partial joint replacement. You will find more details in the "My procedure" section.